by umbrella through October 3 at The Murat Theater, 502 N. New Jersey Street. Somehow managing to be vain and adorable simultaneously, this ever-popular nanny is portrayed practically perfectly by Caroline Sheen. Sheen depicts the narcissistic nanny, with a tough-love approach to dysfunctional families, flawlessly. Whether teaching life-lessons, dispensing a Spoonful of Medicine, or joining a group of chimney sweeps as they Step in Time, the Banks brood receives an ample dose of love from the prim and proper governess. Charming, chimney-soot-smudged Bert is played by Nicolas Dromard. Dromard gains the spectators’ affection from the start and has them waiting for one more sideways glance or irresistible dimpled-smile. He keeps the audience with him throughout the journey and knows, instinctively, that they will follow him even to the rooftops. Laird Mackintosh provides a stern-due-to-his-upbringing father in George Banks, unable to see his own inflexibility, cold attitude and need to be one of the “best people,” are creating numerous problems for his family. The financial expert eventually finds his compassionate side through the help of the all-knowing Poppins. 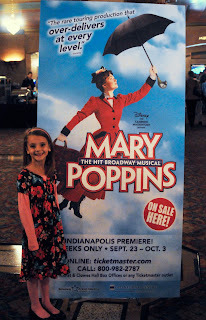 Katie Whitehouse, Fishers, attends Mary Poppins. The pop-up storybook house magically opens and welcomes you into its movable rooms and levels, including nursery, living room, kitchen and rooftop. A park changes from gray and dreary to energetic and vibrant awash with hues of violet, orange and turquoise with a stroke of Bert’s brush and a bit of Poppins’ magic. Statues spring to life and a parade of kites fill the perfect blue sky as the Banks children learn to care for something besides their own wants. Unfortunately, this column is not long enough to mention every single member of the cast as they so richly deserve. The bigger-than-life characters are so real it’s difficult to remember they are being portrayed by actors. When the theater fades away, when reality ceases, when fantasy and tale become real, you know you are watching a magical moment. Bottom Line: A story dear to the hearts of one generation has officially been handed down to a whole new generation of children, bewitched by Broadway Across America’s Mary Poppins. Elizabeth J. Musgrave is a syndicated columnist, travel writer and theater critic. Catch her as Indy’s Arts & Entertainment Adviser on 93 WIBC and follow her on Facebook, Twitter and at gottago.us. With the following comment, Michelle B. won the Mary Poppins tickets in the Gotta Go Giveaway. She told us, within the allowed 25 words, sometimes a favorite movie can be painful. Ouch! "As kids, watched Mary Poppins with my cousin Donald - he TRULY believed umbrellas would make him FLY from the garage roof. NOPE...broken elbow instead." She will receive four tickets to the Broadway Across America production Thursday, September 23, 7:30 pm, at The Murat Theatre in Indianapolis. Thanks to everyone who entered, keep watching for another chance to win tickets. Thanks to Broadway Across America for donating the family four pack and to WIBC's Joe Ulery for letting listeners know about the contest. Comments can and questions can be sent to elizabeth@gottago.us. Gotta Go is published in the following newspapers: South Sider Voice, Indiana Weekender, West Side Community News, New Palestine Reporter, West Indianapolis Community News, Pendleton Times Reporter and Fortville-McCordsville Reporter. Often a comedic actor is underestimated in his talent, so easy does he make his style appear to the audience and critics. And, yet, you will find that he is often a fantastic dramatic talent, as well. 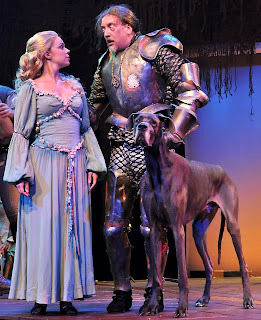 Jeff Stockberger has proven my theory in the Beef and Boards, Indianapolis, performance of Lerner and Loews' Camelot. Stockberger, one of my Destination Actors, steps, not once, but twice, into the Gotta Go spotlight this week. The first in a slow, sure-footed way as Merlyn, the mentor and magician, who guides young King Arthur, portrayed admirably by Douglas E. Stark, into his future as the idealistic ruler of Camelot. Stockberger's second entrance into the spotlight is a little, sideways-sauntering gait, of sorts, as King Pellinore, the whimsical guest who arrives for a visit and never leaves. Do not enjoy Mr. Stockberger's zany side and cast out his less flashy, dramatic ability. Being able to switch costumes and characters, mid-show as he does, requires a skill we should not ignore. The well-known tale of the Knights of the Round Table heats up when a love triangle ensues between Sir Lancelot, played forcefully by Tony Lawson, Queen Guenevere, played by Krista Severeid, and the king. Add in the side issue of illegitimate son Mordred, which brings me to the other performer in the Gotta Go spotlight this week. 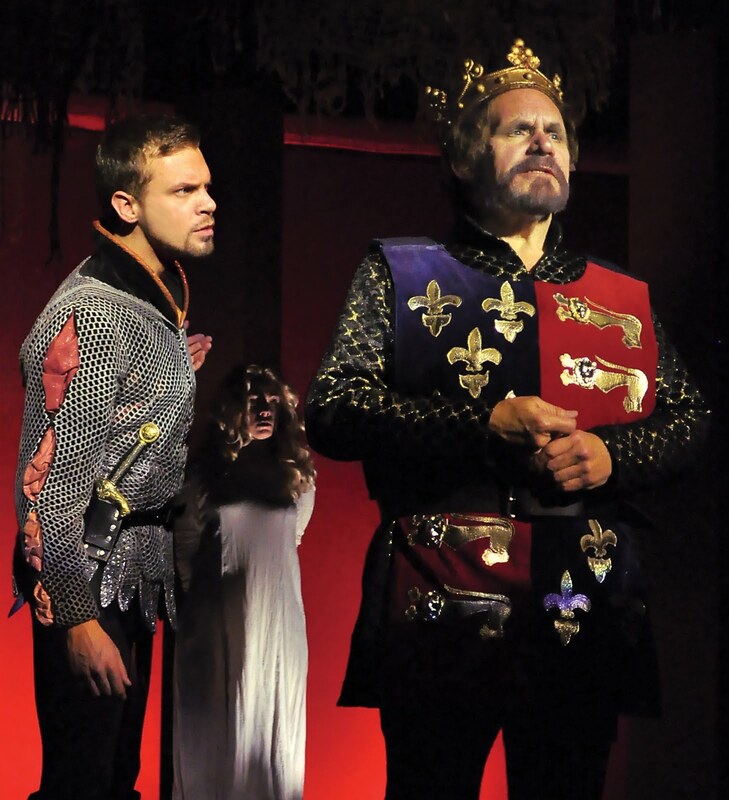 Danny Kingston brings his own delightfully spiteful and vicious, twisted version to Mordred who hopes to eliminate, well, pretty much everyone who stands in his way of wearing the crown. He then incites jealousy, anger and yearnings within his fellow knights in a thoroughly wicked fashion. It's a joy to watch Kingston being so very good at being so very bad. A special mention goes to set designer, Michael Layton. Creating a believable, theatrical set on a stage as small as B&B takes cunning and a deep desire for a challenge. Apparently Layton has both, as this set truly envelops the dreamy feel required for this musical, without losing the starkness of the reality which befalls the king. Sir Thomas More is credited with creating the word, Utopia, meaning nowhere, when he wrote of a romantic mythical land of honour and chivalry. Only in fiction can a place exist where eternal happiness flows like a babbling brook, the government handles efficiently all matters necessary, and the military personnel frolics around a maypole with the ladies. Stark offers a credible depiction of idealistic Arthur, who places his hope for the future of that unattainable perfect world into the hands of the next generation. In fact, I would say this is a role well suited to Stark, and my favorite thus far, showcasing his vocal abilities. Bottom Line: The talents of Stockberger, Kingston and Stark shine in sharp contrast, making Beef and Boards' Camelot a dreamy delight. Indianapolis City Ballet’s An Evening with the Stars danced its way onto the stage at The Murat Theatre this weekend. Principal dancers from around the globe, China, Japan, Australia, Russia, Mexico, Brazil and the United States were brought together for one night, to share their talent and passion of ballet. Contemporary to traditional and signature pieces were showcased, including a return of last year’s most popular dancer, Miguel Quinones. Quinones’ Caught once again received a well-deserved standing ovation. The David Parsons-choreographed piece delighted the audience with its special lighting giving the appearance of the dancer flying without wires. Other dancers receiving a large portion of the accolades were Daniil Simkin in Les Bourgois, music by Jacques Brel, in Act II, and Ivan Vasiliev. Compared to famous ballet dancer Mikhail Baryshnikov, Vasiliev performed two numbers, Flames of Paris and Don Quixote Pas de Deux, both with Natalia Osipova. Mary Poppins' annual visit, via an umbrella, to my television set as a child is a cherished memory. My mother created an excitement in the air throughout the week, humming the songs, quizzing us on various Mary Poppins movie points, and making fudge and caramel popcorn for the event. That evening we would all (six kids and two adults) camp in the living room, in front of the television set, and slip into the fantasy world of Walt Disney. So entranced were we, as children, no one tugged on anyone's hair, no one pinched their little sister or even pushed for a better seat on the sofa. For a few hours, we just had a Jolly Holiday with Mary. In the comment section, write your favorite Mary Poppins memory from any time period of your life, in 25 words or less. Pictures are allowed if you feel it would enhance the story. The winner will be announced via Twitter, Facebook and in an email to the winner. You must leave your full name and email address so we are able to contact you. Entrants may not be related to Elizabeth J. Musgrave. Entries must be in by noon, Sunday, September 19, 2010. The winner will be contacted by noon, Monday, September 20, 2010. Tickets are not exchangeable, refundable or transferable in any manner. Tickets are for the Thursday, September 23, 2010 performance and may not be switched to another performance for any reason. All questions should be directed to elizabeth@gottago.us. Do not send questions to the newspaper, radio and Broadway Across America. Four tickets to the Broadway Across America presentation of Mary Poppins, Thursday, September 23, 2010, The Murat Theatre in the Old National Centre, Indianapolis, IN. Instructions regarding ticket pick up will be given to the winner by e-mail. If you've read Gotta Go for any length of time, you'll know I enjoy a glass of vino now and again. Red in particular. It's a rare treat to meet a sommelier (wine expert) and even more rare to get the opportunity to have a talk with a master sommelier. With only 150 in the world, they are considered the best of the best. I got just such an opportunity recently after stumbling upon Tim Gaiser's DVD Think Like a Genius: Wine Master. 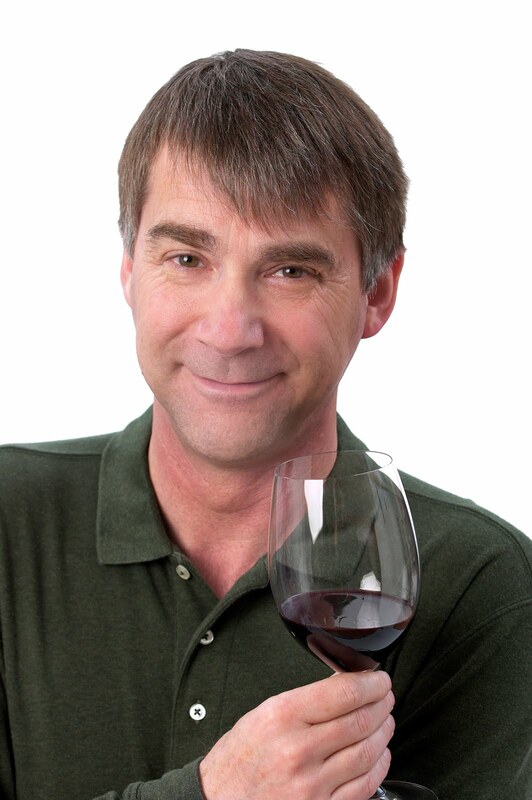 Gaiser is a master sommelier and current Education Chair for the American Chapter of the Court of Master Sommeliers. Translation: He knows his stuff. The Genius method was created by Tim Hallbom, behavioral scientist, and deconstructs a genius while at his craft. Streamlining the process is Taryn Voget, CEO and co-founder of Everyday Genius Institute, San Francisco, California. They slowed Gaiser down, checked out his method and got it on tape. It was created to help novices understand what they are actually smelling, tasting, and seeing. He was kind enough to share some wine tips with me, almost a Wine Tips: 101 class, if you will. With Gaiser living in San Francisco, the interview between the wine wizard with 25 years of experience and me came via telephone. I asked and he answered. Ready? Q: Is price an indicator of quality? A: No; there are great wines at practically every price point. Q: N ame some bare essentials for someone starting out. A: Decent glassware, a good beginning wine book, like Karen MacNeil's The Wine Bible, and wine-tasting classes. Q: What is your opinion on which wines to use with cooking? A: If it isn't good enough to drink; don't cook with it. Q: What do you recommend to someone who wants to store wine without spending a large amount of money? A: Don't. Wine needs to be stored at the correct temperatures. If you cannot store them properly, then buy a few bottles at a time and drink them; don't try to store them. Q: Is the genius method good for beginners? A: Yes. It makes people aware of the process of how they remember what things smell and taste like, their internal process. Q: If there is one thing you would like people to remember about wine, what would it be? A: Wine touches everything, ecology, archaeology, history. It's the great connector; it connects people. Wine tastings narrow down which types and flavors you prefer. Wineries are a good place to check out some local wines. Remember, however, that wineries offer a specific grouping of wines...theirs. To check out wines from around the world, a wine-tasting class and tastings at wine shops and restaurants help broaden the field. Once you are comfortable with wines, try out a food and wine pairing class or a wine-making class. Bottom Line: Don't despair if you don't become an expert overnight. There is a wine for everyone, and you can always try, try again. *Special thanks to Taryn Voget, Everyday Genius Institute, CEO and co-founder, Tim Hallbom, behavioral scientist and co-founder, and Tim Gaiser, master sommelier for their input and information included in this column. 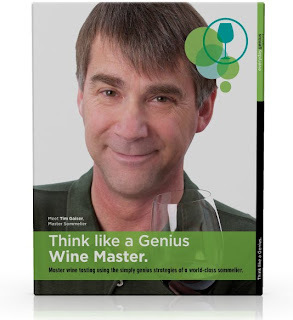 *Click on the following links for more details on the genius method, wine tips, The Wine Bible, and the WIBC interview between Tim Gaiser and Elizabeth J. Musgrave on Joe Ulery's Saturday Morning News Show. Oh, who am I kidding? I get invited to go boldly (translation: blindly) into new experiences all the time. In fact, that's what I'm known for...getting myself into adventures about which I have no clue. Which is another way of spelling T.R.O.U.B.L.E. In, yet one more Lucille-Ball-meets-Rachel-Ray moment, I agreed to pay a game of F.E.V.E.R. (we know it as H.O.R.S.E.) 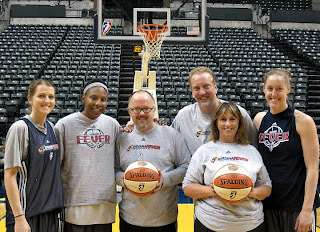 with one returning Fever player and two basketball players trying out for the WNBA Indiana Fever team. I decided to bring some help; some really tall help. My thought process was to bring great athletes with me. This would give me a chance to, for once in my life, win at an athletic event. The problem being that I don't know any athletes, professional or otherwise. Bring in teammates who could pretend they know how to play basketball. At least for a few minutes until we get whipped by the powerful Fever women. 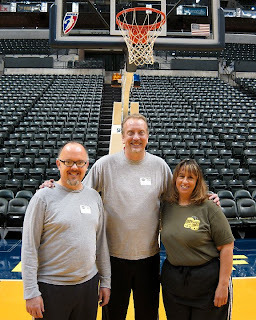 Patricia Rettig, media and public relations director of Beef and Boards, 9301 N. Michigan Road, Indianapolis, hooked me up with some bodyguards, er, um, I mean teammates. 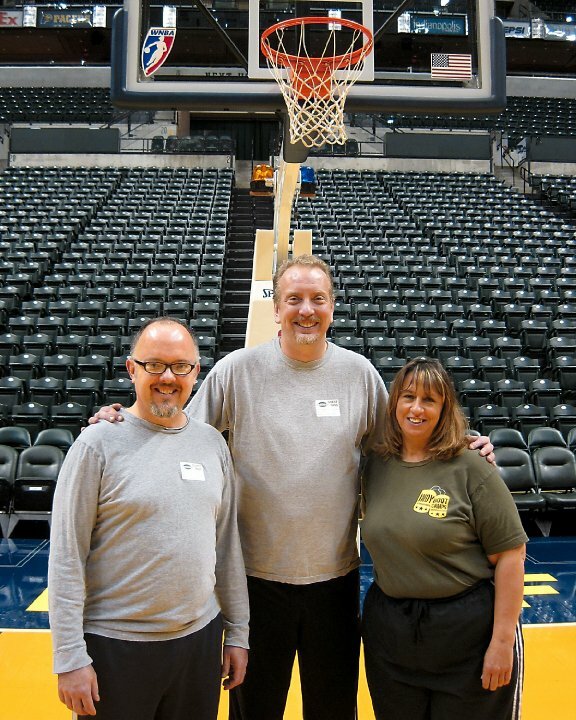 Eddie Curry, casting director of Beef and Boards, and an actor, Jeff Stockberger, assistant director of Beef and Boards, and also an actor, and Elizabeth J. Musgrave, writer of the finer things in life...non-athletic. Okay, actors, acting like they can play basketball, and a writer (me) writing about the event afterward (now) against three really tall, physically fit athletes. Did I mention I am vertically and athletically challenged? Three women, professional athletes, looking fierce. Allie Quigley, Christina Wirth and Shay Murphy. Although all three tried out for the team, Murphy is the athlete who made the team, proving to be an asset early on. Now, I am not going to say the athletes were scared of us or anything, but I am sure they were worried. You believe that, right? Well, I bowed out first, then Jeff Stockberger, and, well, you get the idea...it wasn't pretty. Curry lasted the longest with the pros. The winners were gracious and didn't laugh at us. Not too much, anyway. 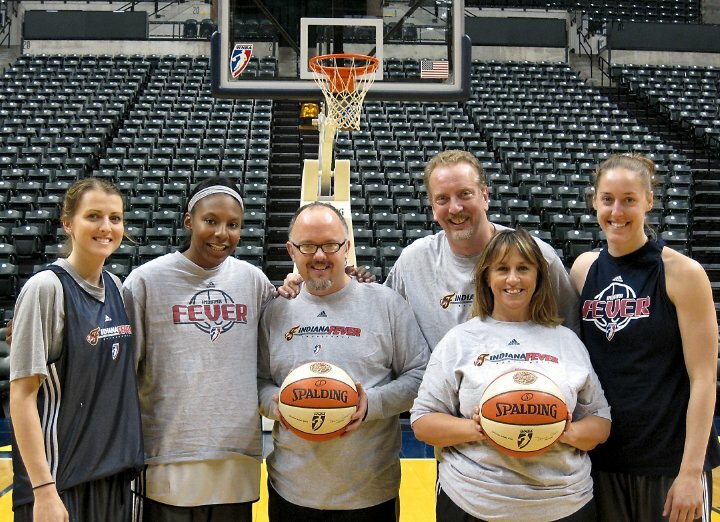 Bottom Line: I do not feel bad that I was barely beaten by the WNBA Fever team. Not one bit...oh, okay, humiliated was more like it. However, considering they are playing Game 3 of the series in New York tonight, losing to that particular group of athletes makes us members of that large club: teams taken down by The Fever.